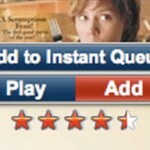 Netflix removes DVD Queue from streaming apps – a bad idea? Netflix has said it is removing the the “Add to DVD Queue” from streaming devices, which would force you to log-on to your computer to manage your DVD/Blu-ray Disc queue. Bad idea? We think so. And, so do many of the 400 who have already commented on the Netflix blog. Product Manager Jamie Odell says the “[Add to DVD Queue] complicates the instant watching experience and ties up resources that are better used to improve the overall streaming functionality.” But it seems a heck of a lot more complicated to have to go to your PC to set up your DVDs-by-mail. This isn’t the first time Netflix has made decisions that customers don’t agree with. Remember the removal of the “Friends” link? And, remember the uproar when Canadians got a streaming-only service? I have no idea how a simple link to add a DVD to a queue could complicate the instant watching experience. It completely makes sense to add a movie to be sent by mail if it isn’t available to stream. Especially, if the title isn’t available in HD. Is Netflix hiding something else?